The Historic Burnett Mansion is an important part of Sapulpa’s heritage. With it’s majestic columns, stained glass windows, and hand painted decor; it is truely an architectural jewel. The House was built in 1911 by an early day oilman, Bates Burnett. 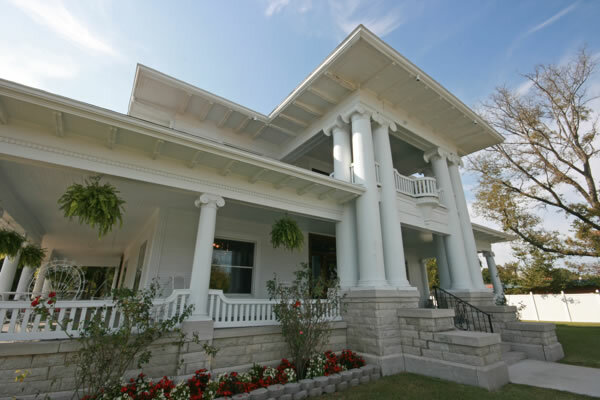 He was a southern gentleman from Tennessee who wanted to build a home that reflected elegance and style. He spared no expense in its construction. The wealth of detail and care is evident throughout the home. Although, Mr. Burnett made his fortune in oil, he was also successfully involved in banking, railroads, and hotels. His political ventures included lobbying to make Sapulpa the county seat. In 1903, He married Dannie Ross, a direct descendent of the Cherokee Chief, John Ross, they had two children, William James, and Elizabeth Kathrine. 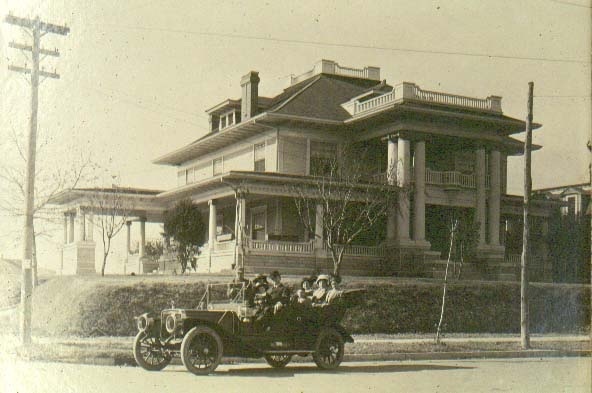 The Burnett Home was the social center of Sapulpa, hosting many lavish parties. In fact, the house has a ballroom with a spring loaded dance floor. Sadly, Bates Burnett enjoyed his dream home for only a short time. In 1926 He fell ill on a business trip to New York City and died suddenly. After Mr. Burnett’s passing, the music stopped and the parties ceased.The next half-century, the family was very reclusive and only a select few were allowed inside the home. His wife and two children lived there until the last of them passed away in 1984. At this time, the property was sold and subsequently fell into disrepair. The Firey family purchased the mansion in 2007. They took this “diamond in the rough”, and after extensive restoration, it was opened again to the public. For the past several years it has been a place for weddings, receptions, and parties. Thousands have toured the mansion and relived it’s glorious past. Now a new page has turned. Miss Scarlett’s Tea Room opened in November 2013. Our mission is to provide an elegant setting that will nourish you, both physically and spiritually. Miss Scarlett’s is quickly becoming a destination restaurant for all those who are tired of the modern trappings of fast food and poor service. We hope you enjoy the cuisine and the atmosphere as you experience a little taste of Oklahoma history. Just pleased the beautiful home is still looking like home. I shared a hospital room with Katherine a very long time ago.She thought that she had to take care of me it was really funny. She invited me to come & see her home never got around to until after she was gone. We are so glad to give back this beautiful home to the community, we have taken good care of the home since 2008, I think Katherine would be very proud of what her family as well as our family has done to protect the future and legacy of the this lovely and historic home.